The 2018 Philadelphia Eagles season was an odd one. As defending Super Bowl champs, the Eagles dealt with, among other things, a potential Super Bowl hangover, roster turnover and a bevy of serious injuries. But the most unavoidable storyline of the year involved Carson Wentz, who came off a near MVP season and later ACL tear to return, go 5-6 as a starter and then be sidelined due to a back injury. Further complicating matters was not only the return of last season's Super Bowl MVP, Nick Foles, who seemed to almost immediately get the offense back on track, but also that Wentz will be up for a new, likely monstrous contract at the end of next season. So what happened? Why did the team play better behind Foles? Was it simply that Wentz was playing injured? Was it something else? The circumstances surrounding Wentz and the Eagles’ offense were peculiar and we started asking questions. Over the past two months, PhillyVoice spoke with more than a half dozen players, plus other sources close to the team, who all requested to remain anonymous — fearing repercussions given Wentz' power within the organization. 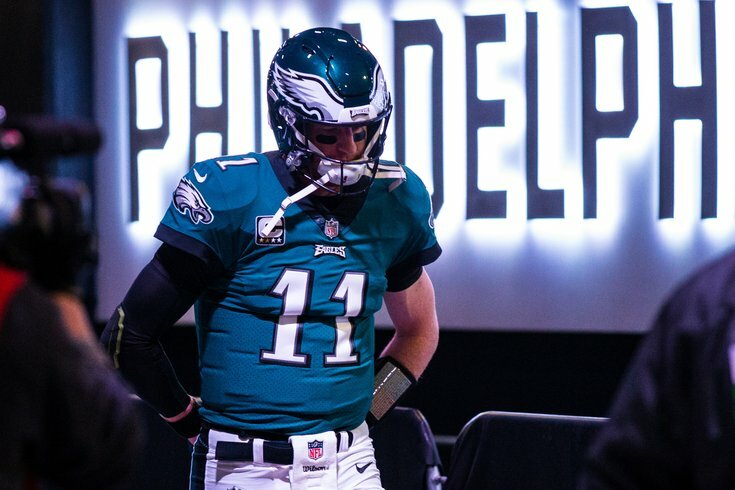 And what they told us paints a somewhat different picture of the Eagles' locker room – and their franchise quarterback – than one might expect. Whereas some circles blamed the Eagles’ offensive failures on new offensive coordinator Mike Groh, numerous sources in and around the NFL and Eagles said they thought Wentz may have been the root of the Eagles’ offensive problems. Groh is a “good coach,” who was “bullied” by Wentz, according to sources. The problem with the offense this past season shouldn’t lie with Groh, it should “lie with Wentz,” they said. Last Tuesday, Eagles coach Doug Pederson declared Wentz the starting quarterback moving forward. This was different in 2016 and '17 under former Eagles coaches Frank Reich, now the Indianapolis Colts’ head coach, and John DeFilippo, the new Jacksonville Jaguars offensive coordinator, because they would rein Wentz in and stop him from going off-point, sources said. Reich and DeFilippo are two respected, entrenched NFL coaches who have experienced success. They forced Wentz to run the Eagles’ offense, a Super Bowl-winning offense that scored 41 points in the biggest game in franchise history and outdueled all-time great Tom Brady. The Colts' offense nearly mirrored the one run last year by the Eagles. Reich and DeFilippo stressed to Wentz the importance of sticking with the play that was called — a completed pass was there waiting. When Wentz deviated from that, it was sometimes met with bad consequences, like an interception or a sack. 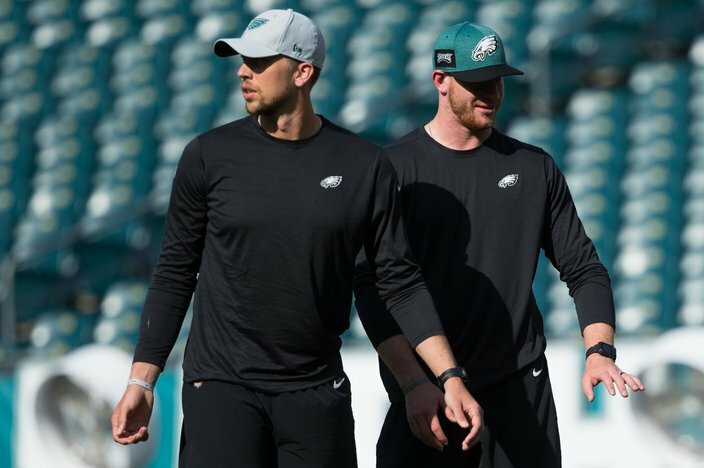 When Wentz trusted what Reich and DeFilippo called, it led to an MVP-like season that produced an Eagles’ single-season franchise record 33 touchdown passes and an 11-2 record in 13 games. Pederson, Reich and DeFilippo were the perfect storm of coaches. Each had their strengths, and each complemented one another. Aggravation came in knowing that if Wentz was the more dominant player — and he is — why wouldn’t the offense be even more prolific with him running it than Foles? The glaring difference is that Foles, every source stated, would go through progressions within the offense — exactly how it was designed to run — and hit the open receiver, regardless of who it was or where they were on the field. Wentz only saw, it seemed, one receiver the majority of the season: Zach Ertz. This understandably frustrated the rest of the offense, considering other receivers were open downfield. To stop the Eagles in 2018 under Wentz was rather easy: Stop No. 86. Carson Wentz spent much of the last year living in the shadow of Nick Foles, instead of the other way around. In 2017, the Eagles won by gassing teams. In 2018, Wentz’s penchant to show so little confidence in other aspects of the Eagles’ offense not only limited its performance — in turn, it limited Wentz. He took more abuse this season (31 sacks in 11 games in 2018, as opposed to 28 sacks in 13 games in 2017) than he did his first two years in the NFL. That came partly because Carson Wentz couldn’t be “Carson Wentz,” the Teflon ginger that mesmerized the NFL in 2017 with his Harry Houdini escapes, since he was nowhere close to being 100-percent healthy, despite what Wentz has said publicly. Losing Torrey Smith, Trey Burton, Brent Celek and LeGarrette Blount is important to note. Smith, who was not a great player, knew where to find openings on the field and made tough catches. Burton was under-appreciated here and created matchup problems. Celek played an integral role in the offense, and was reliable. Blount was a pounding runner who took stress off Wentz in the red zone. "We know what type of player he can be, and who he normally is," one source said. "He needs to realize it’s the Philadelphia Eagles not the Philadelphia Carsons." After practices, Pederson will single out a player and ask what accountability means to him. After a particularly biting loss in November, there was an awkward moment. Pederson asked one of the more prominent offensive players to define what accountability means. So fed up with his limited role under Wentz, the player said nothing. He checked out. By early December, after the overtime loss in Dallas, the team’s whole synergy changed when Foles took over. The last three games, the Eagles were running “training camp” plays — and winning, sources said. Because the Eagles’ offense — the Super Bowl-winning offense — was being run the way it was meant to be run. Doug Pederson deserved Coach of the Year honors and a Nobel Prize for the balancing act he performed this past season. One can easily make the case that he did a far better job coaching this season just to get the Eagles into the playoffs than he did last year in winning the Super Bowl. And Pederson wasn’t — nor isn’t — about to throw his franchise quarterback under a bus about anything. But he does listen to his players, and very much cares about their input. The Philadelphia Eagles did not immediately return a call seeking comment on this story.